I'm drowning in a sea of boxes. They are everywhere! I think they're like the energizer bunny, they just keep going, and going, and going! 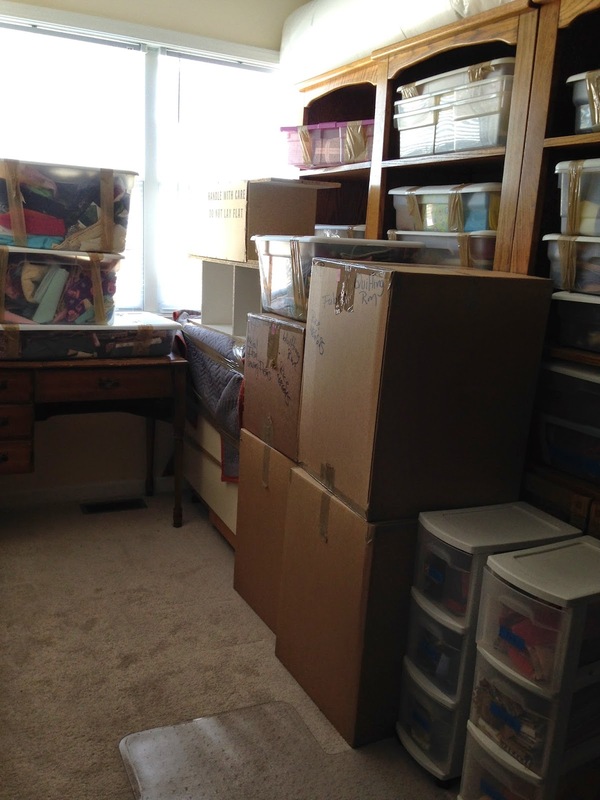 You can guess how many boxes the "packing people" boxed up by leaving a comment on this post. I'll give the prize away on Mar 15th. I am making progress but gosh it sure is slow. My studio is in a "loft" above the garage but inside the house. Does that make sense? You go upstairs halfway to a small landing and can either go on up to the loft (a former media room) or you can go on upstairs to the bedrooms. This is what my studio looks like right now. Pretty much a mess. My cutting table will go along the short wall in this picture above. But guess where the cutting table is? It's clear back in the corner of the last picture still wrapped in a moving blanket. Hopefully I won't have to move too many of these boxes yet. I'm hoping I can get them unpacked instead of moving them to unpack something else. The frame for Queenie is laying across the room right now. It need to be moved as it's going to sit lengthwise in the room. Gotta move stuff to get it setting where it belongs. The table to the far left in the picture above has to be moved to the alcove by the windows in the picture below. And the sewing table by the windows goes clear across the room. Thank goodness those bookshelves will stay where they are! See what I mean about it being a jumbled mess.... William helped me move things around a bit. Funny thing is when you unpack a box or two, you make a bigger mess than you had to begin with. The packers like to put random things in the boxes and sure as the heck don't label them with what is in the box. Either that or their definition of something is completely different than my definition. Take for example a box of canning jars was labeled "jugs". And a box of antique crocks was labeled "jugs" also. I wouldn't call either one of them "jugs". Although having someone pack it all up for you is so nice, I think sometimes I could save myself a lot of work and time if I'd do it myself and label it with something that makes sense. I have to get all these unpacked and things in order by next Wednesday. That's when they are coming to put Queening (aka the longarm quilting machine) together. It has been a month since I've used her. I sure hope I remember how. I'll post pictures as soon as it's all in order (or at least somewhat in order)! Moving is the easy part, unpacking is the hardest part! And, no one can help you cause you need/want to know where everything is so you can get it!!! my guess is 679.. but I've never had to move, so it's just a guess.. hope you're back in business soon.. what a lot to cope with! Yikes....that is a lot of work there. Good luck. 179? My guess is 418 boxes. I'm guessing 236 boxes but I'm more than likely way short of the actual number that was used. Before you know it everything will be unboxed and where it should be. Just think of the unpacking as extra exercise being worked into your day. With all the bending, stretching, lifting and balancing you're working every muscle in your body. 126 boxes...packers NEVER pack the way a logical person would! They will even pack your trash if you aren't careful!!! I do not envy you...hate moving!! !